PUMA has kicked the new year off in style by unveiling its next generation POWER boot, the evoPOWER Vigor 1. The new football boot sees PUMA’s greatest design overhaul yet in the POWER franchise, boasting an upgraded silhouette that keeps power and accuracy at the heart of the design. 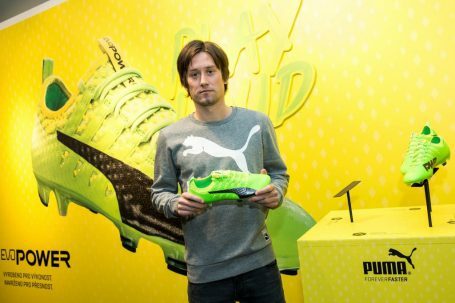 The revolutionary boot will be worn on-pitch by PUMA POWER stars including the likes of Olivier Giroud and Mario Balotelli, and new PUMA ambassadors, Petr Čech and Marc Bartra. Engineered with numerous upgrades to the previous edition, the evoPOWER Vigor 1 is more technical than ever, marking a new era for the silo. The Vigor 1 is the first in the POWER family to feature a stretchable Spandex sock construction, creating an ultra-comfortable slip on boot with a barefoot feeling. The Spandex sock lining works in harmony with PUMA’s next generation AccuFoam upper technology which features a new engineered 3D format. The PU foam dots regulate the uneven surface when the foot comes into contact with the ball, which maximises precision when striking the ball powerfully. The upper is completed with PUMA’s Adap-Lite material further enhanced with a new support cage that allows the foot to bend. The one-way stretchable microfibre upper material supports the biomechanics of the foot while striking the ball barefoot, maximizing both power and precision. This combined with GripTex, a PUMA technology applied to the upper of the boot, helps create enhanced grip and ball control. The evoPOWER Vigor 1 outsole remains the same as its predecessors as a result of popular demand, featuring a mix of bladed and conical studs. Based on PUMA’s research into how force travels on the stance and kicking legs, the boot features bladed studs that ensure perfect ground penetration and stability, especially on stance leg, and conical studs for optimal agility. The evoPOWER Vigor 1 emanates POWER with its bold styling and colour, featuring a sleek new look in allover Gecko Green finished off with Safety Yellow and PUMA Black detailing. The diamond shaped PU dots in Safety Yellow on the sock liner not only advance the performance of the boot, but also fashion a subtle graphic pattern across the upper, which has been replicated in the outsole. The overall look is rounded off with finishing touches in PUMA Black, from the iconic PUMA Formstripe and evoPOWER branding on the tongue to decorative details on the outsole. The new evoPOWER Vigor 1 is now available for purchase on www.puma.com, PUMA Stores and football boot retailers worldwide.